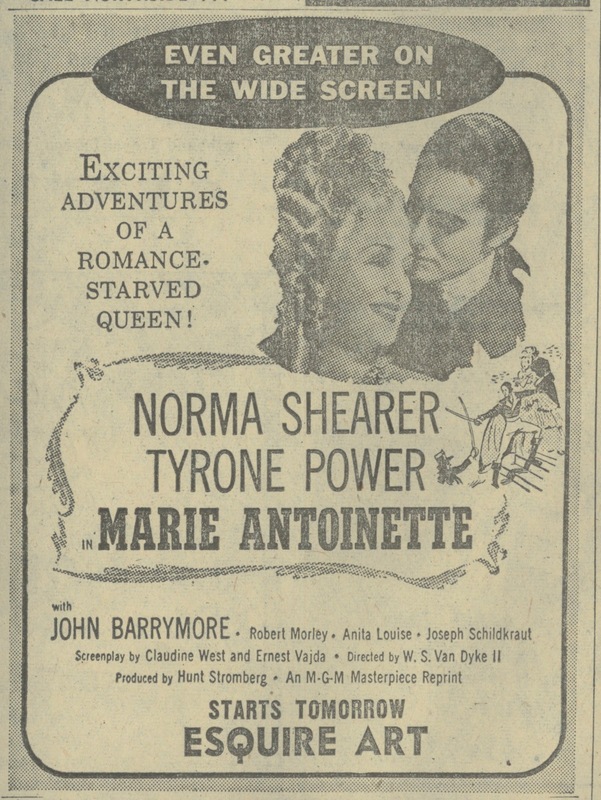 METRO REISSUES ON THE TUMBRIL --- Would you have paid admission to see Marie Antoinette on 2/6/57 at Cincinnati's Esquire Art Theatre? Be mindful that virtually all of MGM's pre-48 library was already playing free TV as of the previous fall ('56), and by February of 1957 had nearly canvassed a viewing nation. Metro held out on five titles, however, these to make a last round of theatres before surrender to the tube. 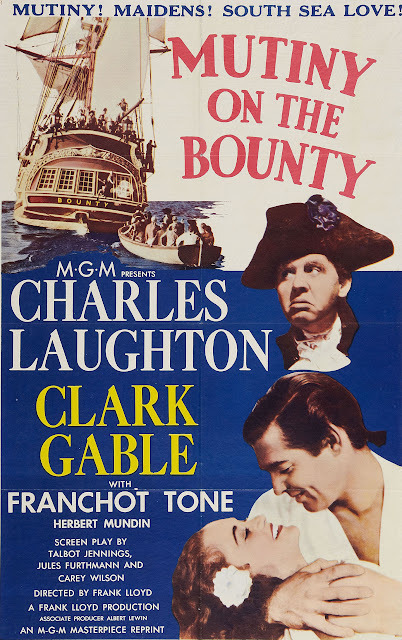 Mutiny On The Bounty, A Tale Of Two Cities, Marie Antoinette, Green Dolphin Street, and Boy's Town were slated for big screens over a remainder of 1956 and part way into 1957. In the past, exhibitors have beefed at the practice of selling TV-committed films to theatres shortly before their video exposure, said Variety, which noted. however, the "degree of success" Elliot Hyman had with pre-48 Warner titles he had bought, then made available to big screens while deals were being worked out with TV stations. Hyman's theatrical distribution subsidiary was called Dominant Pictures. They spread WB oldies among franchise holders who rented to theatres needing cheap filler to round out weekly programs. A Charlotte exchange man who handled the Dominants in our territory told me years ago that the company shipped down twenty features for his franchise to handle, and that bookings generally went for $15 to $20. The Dominants played mostly through 1956 and into 1957, but I saw them turn up close to home into the 60's. 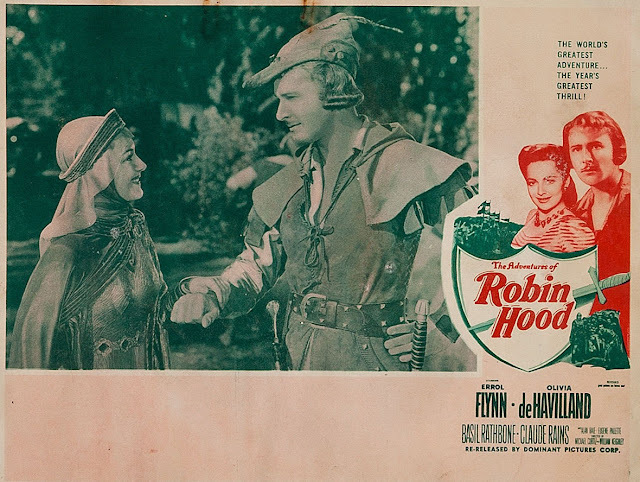 Trouble with these was black-and-white prints of formerly Technicolor titles such as The Adventures Of Robin Hood and Dive Bomber. Robin Hood was still B/W around Charlotte into the 70's, old Dominant prints continuing to rent. The first posters and lobby cards I had for Robin Hood were Dominant's from 1956 (as above), via legend collector Tom Osteen. Enough ramble and back to Marie Antoinette. Did it gross? Not according to Metro bookkeeping ... they saw but $5,000 in domestic rentals. Of the five MGM's reissued, Mutiny On The Bounty did best with $120K domestic. 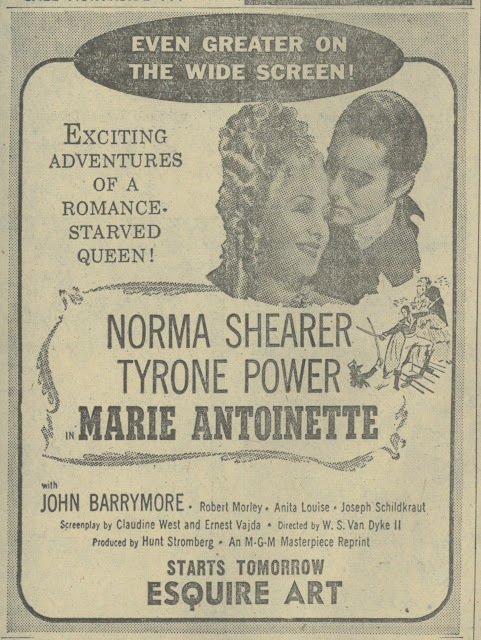 I'd never seen ad art for Marie Antoinette's 1956 reissue before coming across this one from Cincinnati. I like Even Greater On The Wide Screen as added inducement, though prospect of Marie's head cut off, even before she's led to the guillotine, is nearly as off-putting as Adventures Of Robin Hood in 35mm black-and-white. Yes, we do have it better now. As to exhibitor (dis)satisfaction over Metro's scheme, they'd argue, said Variety, that film patrons feel cheated if they have to pay to see the films when the same pix will be on TV shortly thereafter. It's asserted that this practice can result in destroying the good will of the local theatre. 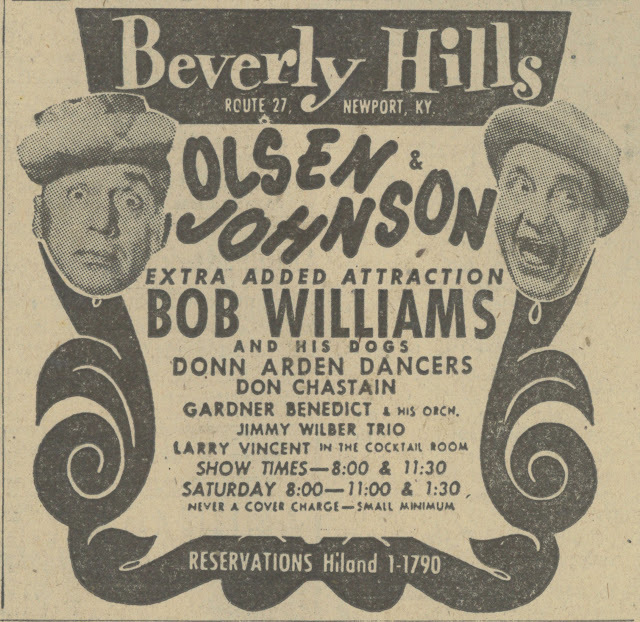 NEW YEAR'S 1957 WITH OLSEN AND JOHNSON --- The "Beverly Hills" in Newport, Kentucky was some swinging place in its day. Gambling went on in back rooms as Buddy Hackett, Ted Lewis, Jack E. Leonard, and numerous others performed on stage. 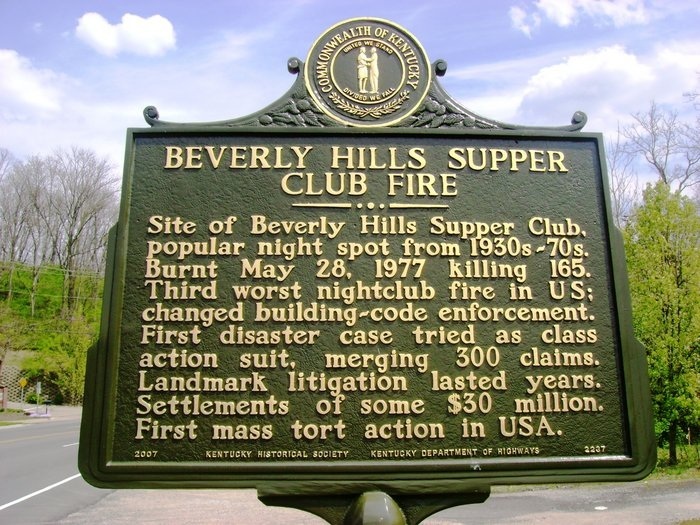 This isn't a first ad I've come across with notables supplying music and mirth to accompany meals there, but what I didn't know about was the horrific finish to this supper club's story ... a fire that swept through and killed 165 people on May 28, 1977. There was said to have been strong Mob presence behind scenes, and some claim the fire was no accident. Official blame was faulty wiring and inadequate exits in case of emergency. I'd planned to talk more about Olsen and Johnson here, but what happened with the Beverly Hills became a lot more compelling. Ads culled from discard newspapers often yield unforeseen levels of drama on further digging. It's occasions like this when Google and You Tube become dark tunnels indeed. John Davidson was the headliner on the night of the fire. He was contacted by a local TV station doing a thirty-year anniversary story on the tragic event, but replied that he'd never spoken about that night and didn't ever intend to. 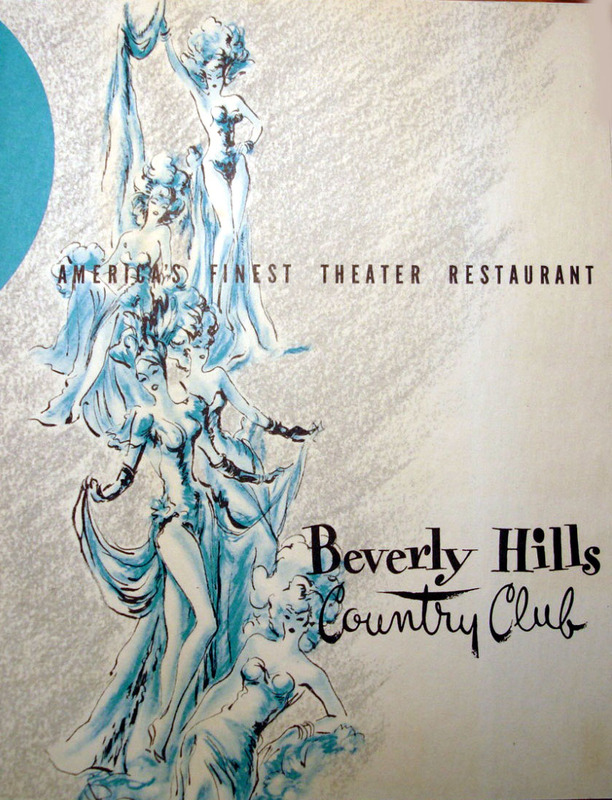 The Beverly Hills is said to be the third worst nightclub fire in US history. There is much chilling footage on You Tube. I'd not advise watching too much of it, because you'll stay haunted by what you see. An enormous cross stands at the site, which has grown heavily wooded since 5/28/77. To see it now, you'd think this was the middle of a forest that had been there forever. A community museum has a room dedicated to the Beverly Hills. There are ghoulish artifacts on display: shoes, menus, eyeglasses, someone's credit card. All this started with me wanting to talk about Olsen and Johnson doing a late career appearance --- almost wish I hadn't come across the ad at all. 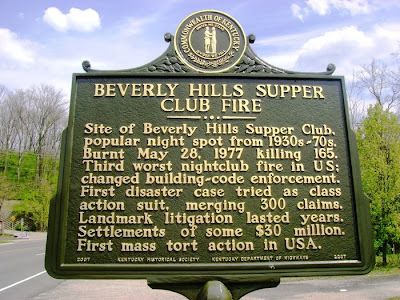 When the Beverly Hills Supper Club fire occurred, I was working at a dinner theatre near Louisville, about 100 miles from Newport. The day after the fire, our theatre's house manager was giving her usual pre-show spiel -- announcing upcoming shows, advising people to visit the bathroom before the show, trying to hustle another round of drinks -- the regular stuff. 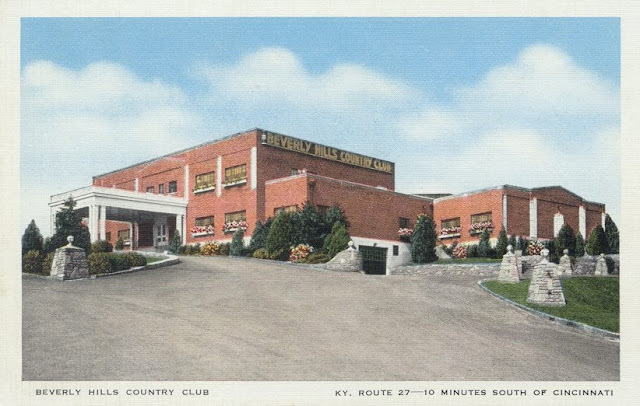 Then she ended her monologue by saying, "I know we're all thinking of the terrible tragedy that happened near Cincinnati last night...in a building very much like this one..." Oh, yeah. That's the way to charm an audience for the coming musical entertainment. The lady kept her job, but was never asked to speak publicly again. 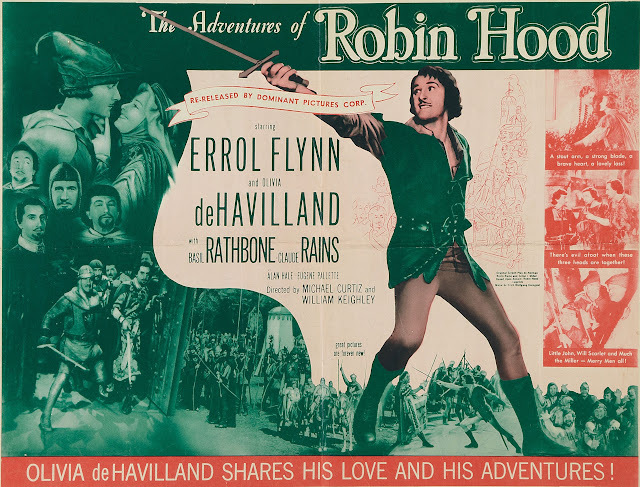 As odd as I find the thought of audiences paying to see a black and white print of ADVENTURES OF ROBIN HOOD, I read somewhere that GONE WITH THE WIND was briefly shown in the early sixties with over an hour cut out of it. Hard to see how, given the tight narrative, this would have worked. Any idea if this actually occurred? 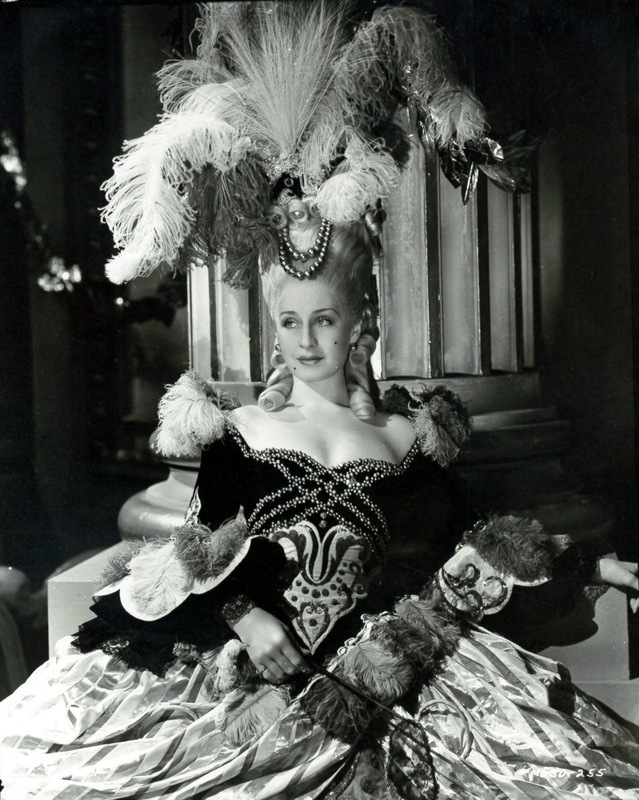 I would definitely have paid to see Marie Antoinette on q theater in the 1950s. Tyrone Power would have been on my radar with his newer films (The Eddie Duchin Story, for instance). And knowing the history of the French court (if not the history of this film), I would have wanted to see the lavish costumes and sets on a bigger screen.